Those strappy, colorful, cute summer sandals have one major downside- blisters. When the temperatures go up, your feet sweat and swell up, causing friction. 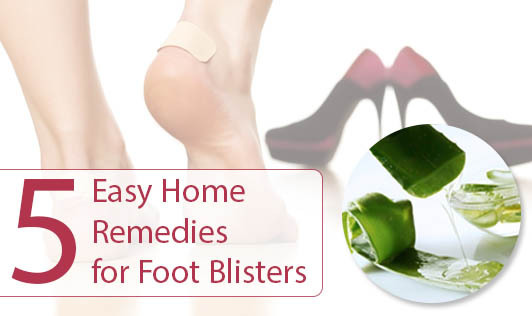 This is followed by painful fluid-filled blisters, which take ages to heal and make walking miserable. Aloe Vera Gel: Aloe vera acts as a natural healer. The natural anti-inflammatory compounds in it helps to relieve redness and swelling. It is also very hydrating, so it keeps the skin moist and heals it faster, especially after the blister pops. Apple Cider Vinegar: Apple cider vinegar has antibacterial properties and thus helps to prevent infection once a blister is popped open. Apply the stingy vinegar gently with a cotton swab around the open or popped area. Deodorant: It prevents odor and an antiperspirant prevents moisture. Together they prevent foot blisters as they keep both moisture and friction at bay. To prevent blisters caused from new shoes and strappy sandals, apply some deodorant on the area first. The deodorant will make the straps slide across the skin and not rub against it. Diaper Rash Cream: This cream contains zinc oxide, which prevents infection and dries out the area, so that it wouldn’t hurt. However applying it can get messy at times. Toothpaste: Toothpaste can take the pain out and dry out pimples, sores, and blisters. However, make sure to use normal toothpaste and not the ones flavored with cinnamon, as they can irritate the skin and cause pain.